New to the forum -- new to Honda CRF's..
Scanning our local Craigslist this past Monday, looking for another Yamaha XT, I came across a 2008 Honda CRF 230L, rarely seen for sale in this area, a classic light weight dual-sport bike. The owner had it stored in his garage and up for sale. His wife had ridden it, putting 7300 easy miles on it since new. She's small, less than 100 lbs, and no longer rides the bike having purchased a 4x4 Quad. The bike was in pristine condition, a one owner jewel. Given that bikes in this nice of condition continue to rise in value as fewer and fewer are offered for sale, I wasn't about to turn this machine down! A 70 mile round trip to Snowflake and the bike came home with us. It's completely stock, like the day it rolled off the showroom floor. Even has its factory original Trail Wing tires still in place -- giving some idea of how little wear it's had given how small the lady who rode it was. The bike starts instantly and runs flawlessly. First Honda I've had since the late 60s and the new Honda 125 trials bike I bought back then. I'll keep this 230L completely stock as I dig into what's the best route to improving overall trail riding performance on a budget. I've got a lot to learn when it comes to how best to set this CRF230L up for riding backwoods trails at 6600 feet and higher. Suggestions or ideas will be greatly appreciated..
George: Arizona native, exploring this beautiful state since the 50's, the last decade riding Yamaha XT's. Recently acquired a pristine factory stock '08 CRF230L. Here to learn all I can from other CRF230 owners and riders..
Re: New to the forum -- new to Honda CRF's..
Looks like you found yourself a nice looking bike. Probably the best thing you can do at this point would be a full service so you know everything is fresh. A good time to invest in a workshop manual since it sounds like you found a keeper. The other thing would be to set the sag at the rear, which will give you an idea if the bikes suspension is sprung to cover your weight. It may have been changed since original owner was light. Looks like original shock spring. This may be shown in owners manual but should be in workshop manual. Ray, thanks for the tips. I appreciate hearing them from you! ...Probably the best thing you can do at this point would be a full service so you know everything is fresh. A good time to invest in a workshop manual since it sounds like you found a keeper. The other thing would be to set the sag at the rear, which will give you an idea if the bikes suspension is sprung to cover your weight. It may have been changed since original owner was light. Looks like original shock spring. This may be shown in owners manual but should be in workshop manual.. I'm still searching for a .PDF of the CRF230L workshop manual. Have the owners manual already, but nothing substitutes for a full service manual. Haven't stumbled into a downloadable version just yet, but I'll keep after it. Fortunately the bike was meticulously cared for by the original owner. It's run on Honda approved full synthetic almost since day one, and the oil was changed just 40 miles before I bought the bike, so it's good on that score. I'll check the rear shock making sure it's set up correctly for my 165lbs. 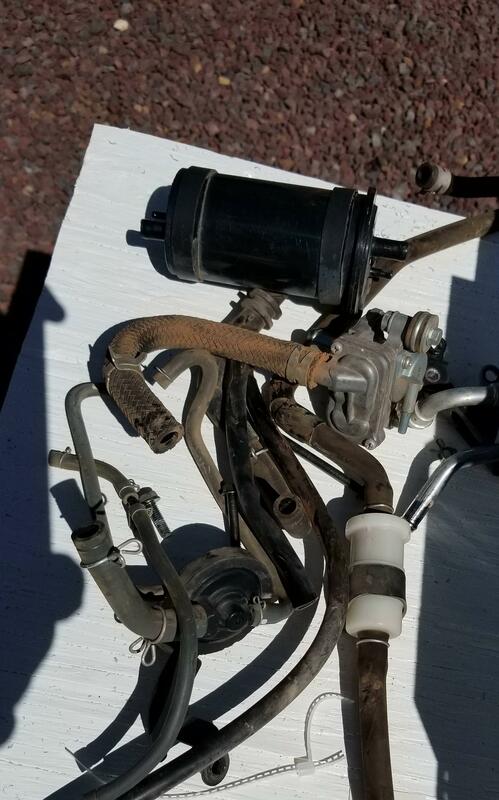 On the Yamaha XT225's I've had, riding at higher altitudes up here along Arizona's Mogollon Rim, I've re-jetted the carburetors, opened up the exhaust so they breathe, and turned the hidden screw at the bottom of the carburetor out three turns. Guessing that's a common series of steps on light weight small displacement carbureted trail bikes, especially those running at altitude. But I'm just beginning to get my feet wet with the CRF230L, so there's lots to learn. Thanks again for your suggestions, and enjoy your CRF230F for all it's worth!.. Yeah Jim I was thinking at 6600 feet the lean factory tune wouldn't be too far off. Maybe tweak the idle mixture screw to see what works. If you do get more than 3 turns out or less than 3/4 turn out then a change of idle jet will need to happen. ...Ray is a wealth of knowledge on CRF230's , so if he says to do anything , its probably the correct thing to do.. Thanks JD. Ray clearly knows these bikes extremely well and he's more than willing to help others get up to speed. That's much appreciated. I'll add that to my 'to do' list for the bike. Going to start on some of these things in the morning once my chores are done. Interestingly enough, the bike runs extremely well here in the high country. I'll check with the previous owners and see if they had any adjustments made for riding at 6600 ft and higher. All their work, except for common maintenance and service procedures, was done by the local Honda dealer. So the bike may already have been set up for higher altitudes. A phone call tomorrow will clear that up then I'll proceed from there. ..Yeah Jim I was thinking at 6600 feet the lean factory tune wouldn't be too far off. Maybe tweak the idle mixture screw to see what works. If you do get more than 3 turns out or less than 3/4 turn out then a change of idle jet will need to happen..
Ray, the original owner says he never made jetting changes. The bike ran well for him at his altitude (he's a 1000 ft lower than we are here on the Rim), and it runs equally as well at our place -- no loss of power that I notice. Removing the exhaust baffle is on my list as a possibly 'to do,' but before that happens I'd like to know what you think about it. I always 'uncorked' the exhaust on Yamaha XT's that I rode, but not sure if the Honda needs it as well. ..Plus I'd like to get rid of the California emissions junk. Don't need or want it here in the high country. I see some guy selling a 'kit' that facilitates that removal, but pretty sure I can do it just as well myself. Won't add much to performance, but the bike will look a lot better with it gone!.. Well if I understand the differences between the carbs of the F vs the L you actually have a different type of carby. The 230F has a 26mm piston type whereas the 230L in 2008 has the 30mm CV (constant velocity) carby. So do not go pulling things off it thinking it is the former type. If you find it goes well you might be best not to play with it till you run it a while and see how you like it. Now the CV carbs are pretty forgiving normally, and you would have to have a good look at the airbox and post up some pictures of the airbox before you think about opening it up. Be interested on your top speed. The parts diagram for the muffler does not show a removal baffle at pipe end, just a spark arrestor, which should always be left in. Don't want to start a bushfire. I would investigate what is on you bikes tail pipe and how hard it is to remove. If you scroll to bottom of site page you will see the Yeltrik site OEM parts where you can look at parts diagrams and order genuine parts. Is the brake lever bent or is it just the angle of the photo? ..Well if I understand the differences between the carbs of the F vs the L you actually have a different type of carby. The 230F has a 26mm piston type whereas the 230L in 2008 has the 30mm CV (constant velocity) carby. So do not go pulling things off it thinking it is the former type. If you find it goes well you might be best not to play with it till you run it a while and see how you like it. Is the brake lever bent or is it just the angle of the photo?.. ..OK, the brake lever isn't bent. Must be the angle of the photo. Pulled the end cap off the muffler and found only the spark arrestor inside as you noted. Not about to take that out. ..Here's what I've done so far. Removed the California mandated emissions junk using a parts kit I purchased and a step by step set of instructions found online. In the process I shimmed the carburetor needle, but it ran 'boggy' under acceleration so I removed the shim and it runs well again.. The air box, filter and snorkel are factory stock. Air filter wasn't very dirty, so I washed it in gasoline then blew it dry with an air hose. Quite a pile of goodies you got there. ..Isn't that the truth! ..
Well you at least made it lighter. The paper air cleaners are meant to be replaced rather than washed. You can tap the dust out between replacement just like with a car filter. There maybe a K&N equivalent that may be better long term. The paper are great at stopping dust so really depends on what it is like where you ride. Seems like air box would let good amount of air through with top off but maybe a few extra holes with if you leave top on. If you leave as is make sure the ends of the snorkell are rounded off so there are no sharp edges. Did you shim the carb needle leaner or richer?